Our first article about forgotten areas we need to vacuum left us wondering where else dirt lingers. Here are five more areas to tackle dirt. TIP: For the best results, and so you don’t have to touch the dirt, you’ll need a vacuum with attachments. Check out the full line of Riccar Uprights, canisters, specialty and central vacuums to fit your cleaning needs. 1. Closets Often one of the most forgotten is where our vacuums often live – the closet. Whether it’s coats, clothes, shoes or utility items, the closet collects debris, too. 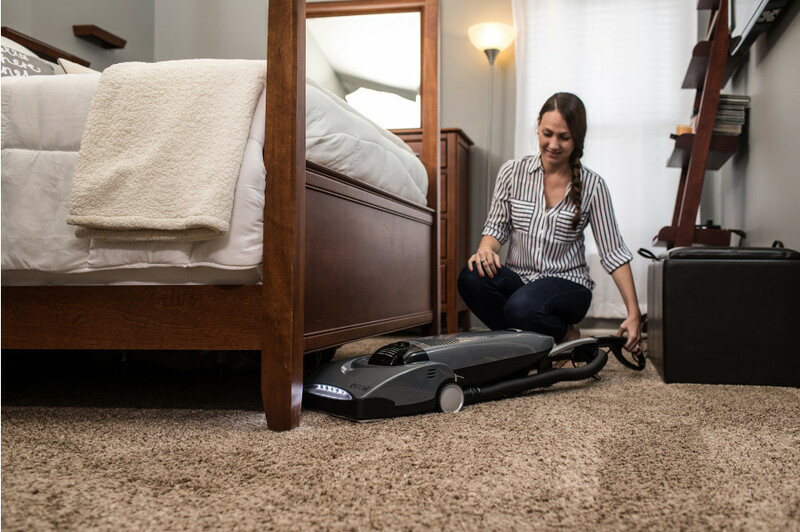 Often a quick swipe with the crevice tool in the upper and lower corners and storage areas, then use the cleaning nozzle at the floor level is all you need. Many people think only upholstered furniture needs to be cleaned but dust doesn’t discriminate. Look at the top of the leather couch in that one spot no one sits in. Or the wood frame of the chair and tables. The dusting brush and crevice tools make great partners to tackle this task – dusting brush for smooth surfaces, crevice tool to reach between cushions and along cushy seems. The upholstery tool is named for its job of handling fabric covered surfaces, so use this tool on your upholstered furniture. For spots where your furry friends like to nap, check out the Riccar Fur-Get-It tool* to get every fluffy fiber. 3. Computer Station: computer vents, keyboards, desks Your computer and general home office area can be a frequent parking spot but is often overlooked when cleaning. Use the dusting brush to clear computer fan vents and desktop towers. Use the Riccar micro tools to clean out crumbs from the keyboard – micro tools come with the Riccar Gem and SupraQuik models. Even if you cannot see the dust, it’s always a good idea to clean blowing and receiving vent covers both inside and out. Use a dusting brush to clean the outside of the vent, then remove the vent cover to clean the back and the area just inside the duct work. Don’t forget about those floor vents which catch and release everything kicked around on the floor or track in from outside. The dryer vent on the outside of your home can be cleaned with the dusting brush as well. Avoid using the vacuum outdoors unless it’s completely dry out – vacuums and moisture don’t usually mix. 5. Refrigerator: rear coils and vents The refrigerator is running but could be running more efficiently if you remember to check the back coils and the bottom vent. Pull the refrigerator out of its cozy home and take a dusting brush to the back side paying special attention to vents. You may also have a floor vent just underneath the doors. Take a peek after pushing the fridge back in and use the dusting brush in this area as well. *The Riccar Fur-Get-It pet hair removal tool comes in two sizes: standard 1 ½ inch attachment to fit most vacuums, or the model which only fits the Riccar Prima canister.